Dr. Chen is a Radiology Resident and Dr. White is a Professor of Radiology and Medicine and Chief of Thoracic Radiology, Department of Diagnostic Radiology, University of Maryland Medical Center, Baltimore, MD. Dr. White discloses grant funding from Philips Medical Systems, Bothell, WA. Coronary artery bypass graft (CABG) surgery is one of the most commonly performed surgical procedures. In the most recent survey of the National Center for Health Statistics, approximately 466,000 CABG procedures were performed in 2005 at an initial hospital cost of approximately $14 billion. 1,2 According to the American College of Cardiology/American Heart Association guidelines, CABG surgery is the standard of care in the treatment of advanced coronary artery disease. Recommended indications include significant left main coronary artery stenosis, stenosis ≥70% in the proximal left anterior descending (LAD) and proximal left circum&#64258;ex artery, and 3-vessel coronary artery disease. 3 The ultimate goal of CABG is to relieve symptoms and prolong life. Notwithstanding the clear benefits of bypass grafting, recurrent chest pain after myocardial revascularization is a common postoperative presentation. 4 The long-term clinical outcome after surgery is dependent on the patency of the bypass grafts and the progression of native coronary artery disease. 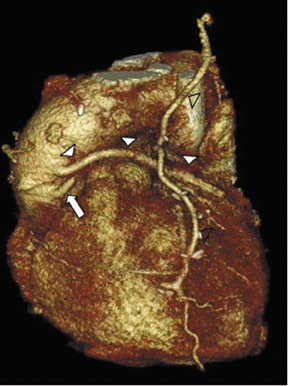 5-7 Conventional coronary angiography is traditionally used to assess the status of bypass grafts, but technical advances in multidetector computed tomography (MDCT) have given the radiologist the ability to evaluate bypass grafts noninvasively. Traditionally, bypass grafts are performed with the use of cardiopulmonary bypass after chemically arresting the heart (on-pump grafting). In recent years, new surgical techniques permit CABG without a heart-lung machine or cardioplegia (off-pump grafting). Debate exists among cardiac surgeons as to which of the 2 surgical approaches is superior, but excellent outcomes can be achieved with either strategy. 8 Benefits of on-pump CABG are that it is less technically demanding, permits more grafts to be constructed per procedure, and, possibly, has better long-term graft patency. Proponents of off-pump CABG suggest that it decreases the length of hospital stay, the amount of blood loss during surgery, and other complications such as renal insufficiency and neurocognitive dysfunction. 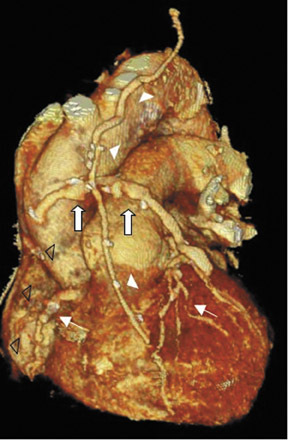 A second area of controversy is whether to focus bypass grafting on the left circulation or to attempt additional grafting to achieve what is termed "total arterial revascularization," which includes the posteroinferior left ventricle. There are a variety of protocols for image acquisition in the evaluation of patients after CABG surgery. 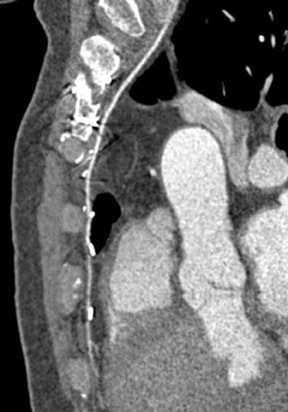 In many respects, the protocol is similar to that for coronary CT angiography (CTA). One important difference is that the scan should be extended superiorly to include the origins of the internal mammary arteries. At the University of Maryland, patients are scanned using a 64-MDCT scanner (Philips Medical Systems, Best, the Netherlands). Patients are placed in the gantry in the supine position. The scan duration is approximately 15 seconds. At our center, scanning is performed in a caudal-to-cranial direction to obtain images of the heart during the initial part of the acquisition when breath-holding is most effective. The acquisition parameters are 120 kV, 0.4-second rotation time, 800 mAs, pitch of 0.2, and 64 × 0.625-mm detectors (Table 1). Cardiac CTA technique requires rapid injection of nonionic, iodinated, low-osmolar intravenous contrast. At our institution, 150 mL of isohexol (Omnipaque 350 mgI/mL; GE Healthcare Inc., Princeton, NJ) with saline is injected using a dual-head injector (EnVision CT Injection System; Medrad, Indianola, PA). To optimize the opacification of the left ventricle, coronary arteries, and bypass grafts, an anatomic, automatic triggering method (Bolus Pro, Philips Medical Systems) is used, with a threshold preset of 150 HU at the region of interest in the descending aorta and a 10-second delay prior to image acquisition. Oral or intravenous beta-adrenergic blocking medications, specifically met o prolol (Lopressor; Novartis Pharmaceuticals Corp., East Hanover, NJ), are administered prior to scanning to prevent heart rate variability and tachycardia. Images are acquired with a heart rate <70 beats per second, if possible, and with breath-holding during mid-inspiration to prevent substantial in&#64258;ow of unopacified blood into the right atrium, which may result in heterogeneity of contrast. Retrospective ECG-gated CTA is essential for optimal image acquisition and reconstruction of evenly spaced phases of the cardiac cycle. The images are acquired in a limited field of view with axial images centered on the heart. Using 60% to 80% of the R-R interval, with 0.9-mm thick images reconstructed in 0.45-mm increments, axial source images, 3D volume-rendered images, and multiplanar reformatted (MPR) images are generated. Both 3D volume-rendering and MPR images are used to assess the bypass grafts, proximal and/or distal graft anastomoses, and the cardiac anatomy. In particular, curved planar images with centerlines through the bypass grafts and native coronary arteries are obtained. To assess CABG patency, a thorough knowledge of CABG anatomy and its configuration on CTA is essential. There are 2 types of bypass grafts, arterial and venous (Figure 1). As a rule, arterial grafts are smaller in caliber than venous grafts. In order of frequency of use, graft arteries include the internal mammary arteries (IMAs), radial arteries (RAs), right gastroepiploic artery, and inferior epigastric artery. Although arterial grafts have better long-term outcomes, venous grafts, specifically saphenous vein grafts (SVGs), are more readily available. 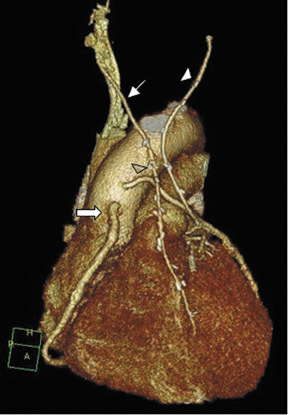 CTA following CABG surgery is done by first assessing the morphology and size of the ascending aorta and in the case of an in situ vessel, such as the IMA, the origin of the in situ vessel. Then, graft patency is assessed for homogeneous, contrast-enhanced graft lumen and for regular shape and border of the graft wall. The graft is usually divided into 3 different segments: the origin or proximal anastomosis of the graft, the body of the graft, and the single (or sequential) distal anastomosis. 18 During the CTA evaluation of bypass grafts, the proximal anastomosis is usually better visualized than the distal anastomosis. In cases in which the distal anastomosis is not well evaluated, the bypass graft is usually considered patent as long as contrast is evident within the graft lumen. Saphenous veins are attached proximally from the ascending aorta to the coronary artery distal to the diseased coronary lesion(s). The SVG can be sutured directly to the anterior portion of the ascending aorta or can be attached with an anastomotic device, allowing faster, sutureless attachment. 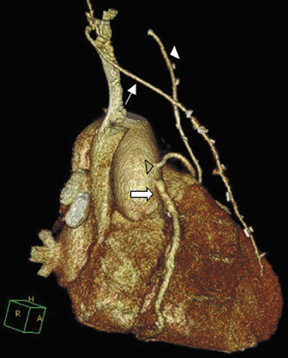 The device alters the common appearance of the bypass graft by requiring the aortic connector to be anastomosed perpendicularly to the aorta. In order to support the course of the aortovenous anastomosis, the left-sided SVG is connected to the left side of the aorta, stabilizing the graft on top of the main pulmonary artery. 25 A right-sided SVG is attached either to the lower aspect or right side of the ascending aorta, allowing the graft to traverse the right arterioventricular groove. Saphenous grafts tend to appear as large contrast-filled vessels. 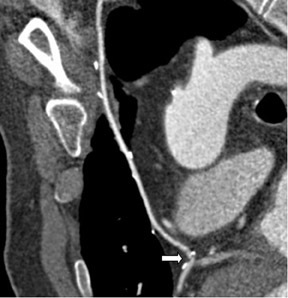 An SVG to the right side is attached to the distal right coronary artery (RCA), posterior descending artery (PDA), or distal LAD artery (Figure 1). The distal anastomosis may lie on the phrenic wall of the heart (Figure 2). An SVG to the left side is attached distally to the LAD artery, diagonal artery, left circum&#64258;ex (LCx) artery, or the obtuse marginal (OM) arteries, by traversing anteriorly and superiorly to the right ventricular out&#64258;ow tract or main pulmonary artery. On occasion, the distal SVG is anastomosed sequentially to ≥2 coronary vessels or in the same vessel, using side-to-side and end-to-side anastomoses. The native vessel distal to the anastamotic site should be assessed and is recognized by its position and smaller caliber compared with the SVG. Typically, there are few if any surgical clips accompanying venous bypass grafts, lessening streak artifacts that may limit graft evaluation. The right IMA (RIMA) is used less frequently than the LIMA. The RIMA can be placed as an in situ graft to revascularize the RCA or one of its branches. In cases in which both in situ IMAs are necessary to revascularize the left heart, either the LIMA is anastomosed to the LCx artery or other side branches (ie, OM or diagnonal branches) and the RIMA is attached to the LAD artery, or the LIMA is connected to the LAD artery and the RIMA is joined to the LCx artery or OM branches by extension through the transverse sinus of the pericardium (Figure 1). 30 Otherwise, the RIMA can be resected from the right subclavian artery and used as a composite or free graft. As a composite or "Y" graft, the RIMA is anastomosed proximally to LIMA, allowing total arterial revascularization instead of using a venous graft with LIMA. Although still controversial, some studies have reported improved clinical outcomes using total arterial revascularization, with reduction of angina recurrence and improved patency rate over a LIMA graft coupled with an SVG. 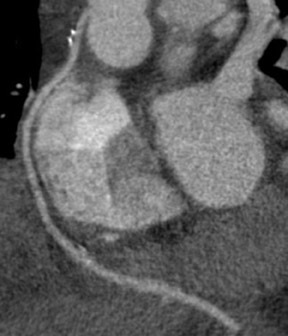 31-33 As a free graft, a RIMA is anastomosed to the anterior ascending aorta and used in the same way as an SVG. The CTA appearance of the RIMA is similar to that of the LIMA. The use of the RA in CABG surgery was first described in 1973. 34 The RA is usually harvested from the nondominant arm and is used as a third arterial graft, either as a free or composite graft or to avoid using a venous graft (Figure 4). As a muscular artery from the forearm, the RA has a prominent medial layer and elevated vasoreactivity, which results in a lower patency rate than that of IMA grafts. 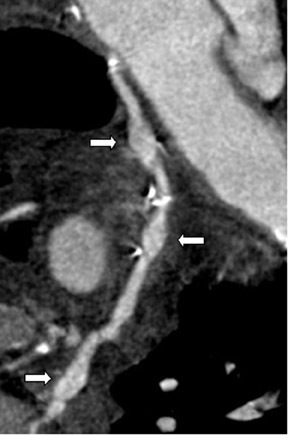 On CTA, the caliber of the RA is similar to the IMA, but it typically is visualized coursing from the ascending aorta to the native coronary artery (Figures 1 and 2). In the early postoperative period, the RA may be reduced in caliber and may be difficult to identify because of vasospasm. In addition, because the RA is a muscular artery, a larger number of surgical clips may be needed to ligate collaterals as compared with IMA grafts. These clips may limit a full CTA evaluation of an RA graft. The use of right gastroepiploic and inferior epigastric arteries in CABG procedures has been limited because of the need to extend the median sternotomy to expose the abdominal cavity. Although the use of these arteries increases surgical time and technical difficulty of the surgery, these arteries can be used as a free graft to perform total arterial revascularization. 35-37 In rare instances, the right gastroepiploic artery may be used in situ to the PDA. These instances require that the surgical history be conveyed to the radiologist so the CTA protocol can be modified to include the upper abdomen, because the gastroepiploic artery is freed to course anteriorly to the liver and through the diaphragm to reach the target vessel (Figure 5). 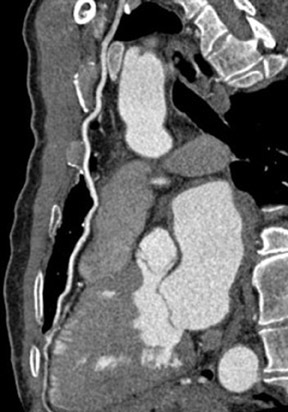 CT angiography can delineate multiple findings associated with graft stenosis and occlusion. 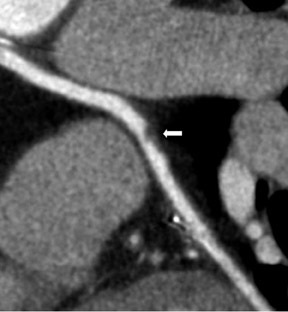 Calcified and noncalcified atherosclerotic plaque is readily identified, and the calculation of the extent of graft narrowing is straightforward (Figure 6). Occlusion can be determined by nonvisualization of a vessel known to have been used for surgical grafting. 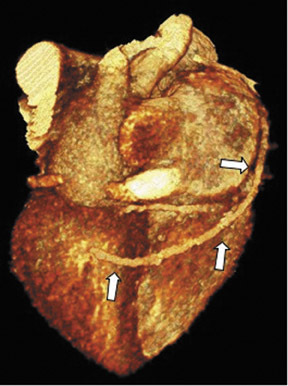 In many instances, the most proximal part of an occluded aortocoronary graft fills with contrast, creating a small, telltale outpouching or "nubbin" from the ascending aorta, allowing a diagnosis (Figure 7). A "ghost" of part of the occluded graft may be visible. Acute or chronic graft occlusion can sometimes be differentiated by the diameter of the bypass graft. In chronic occlusion, the diameter is usually reduced from scarring, as compared with acute occlusion in which the diameter is usually enlarged. Early bypass graft failure can also be due to a malpositioned graft. 40 If the graft is too long, it may twist or kink (Figure 8). If the graft is too short, it may stretch, a particular problem in severe chronic obstructive lung disease patients with hyperin&#64258;ated lungs. 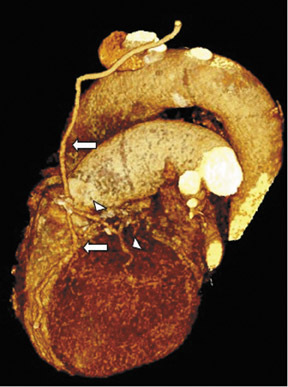 As described previously, the aortic connector can also play a role in kinking the bypass graft if the vessel is not supported adequately. As previously noted, RA grafts are susceptible to vasospasm. The appearance is similar to fixed graft stenosis, although the luminal narrowing is more extensive in length. Nevertheless, the administration of intraoperative alpha-adrenergic blocking agents or posteroperative calcium channel blockers can overcome many cases of graft vasospasm postoperatively. 28,41 Today, the patency rate for RA grafts is approximately 92% at 10 years, similar to IMA grafts. Approximately 75% of patients have postoperative pericardial effusions after CABG surgery (Figure 10). 44 Although pericardial effusions are common, only 0.3% of patients progress to cardiac temponade. 45 Risk factors include postoperative coagulation abnormality or use of anticoagulation agents. Nearly all significant pericardial effusions are diagnosed within 5 days postoperatively, peak in 10 days, and resolve within a month. 46 Postoperative pleural effusions are even more numerous after surgery, a prevalence of 89% 7 days after surgery. 47 These pleural effusions are usually unilateral, small, left-sided, and without clinical significance. Although the intent of CTA after CABG surgery is to assess bypass graft patency and surgical complications, incidental findings are also frequently detected. In a recent study, 13.1% of patients in the immediate postoperative period had unsuspected noncardiac findings, including pulmonary embolism, pulmonary nodules, pneumonia, mucous plugging, and pneumothorax. 54 Therefore, radiologists need to be aware of clinically significant findings with possible life-threatening consequences. In recent years, CTA technology has evolved substantially, allowing radiologists to evaluate bypass graft patency noninvasively with greater confidence. In addition, other postoperative complications that may cause recurrent chest pain can be investigated. Thus, it is crucial that radiologists be familiar with the different types of grafts used in CABG, possible complications, and incidental findings to maximize the effectiveness of CTA after bypass surgery. DeFrances CJ, Hall MJ. 2005 National Hospital Discharge Survey. Adv Data. 2007;385:1-19. Hlatky MA, Rogers WJ, Johnstone I, et al. Medical care costs and quality of life after randomization to coronary angioplasty or coronary bypass surgery. Bypass AngioplastyRevascularization Investigation (BARI) Investigators. New Engl J Med. 1997;336: 92-99. Eagle KA, Guyton RA, Davidoff R, et al. ACC/AHA 2004 guideline update for coronary artery bypass graft surgery: A report of the American College of Cardiology/American HeartAssociation Task Force on PracticeGuidelines (Committee to Update the 1999 Guidelines for Coronary Artery Bypass Graft Surgery). Circulation. 2004;110:e340-e437. Coronary artery surgery study (CASS): A randomized trial of coronary artery bypass surgery. Quality of life in patients randomly assigned to treatment groups. Circulation. 1983;68:951-960. Bourassa MG, Fisher LD, Campeau L, et al. Long-term fate of bypass grafts: The Coronary Artery Surgery Study (CASS) and Montreal Heart Institute experiences. Circulation. 1985;72(6Pt 2):V71-V78. Cameron A, Davis KB, Green G, Schaff HV. Coronary bypass surgery with internal-thoracic-artery grafts-effects on survival over a 15-year period. N Engl J Med. 1996;334:216-219. Campeau L, Lesperance J, Corbara F, et al. Aorto coronary saphenous vein bypass graft changes 5 to7 years after surgery. Circulation. 1978;58(3 Pt 2): I170-I175. Sellke FW, DiMaio JM, Caplan LR, et al. Comparing on-pump and off-pump coronary artery bypass grafting: numerous studies but few conclusions: A scientific statement from the American Heart Association council on cardiovascular surgery and anesthesia in collaboration with the interdisciplinary working group on quality of care and outcomes research. Circulation. 2005;111:2858-2864. Achenbach S, Moshage W, Ropers D, et al. Noninvasive, three-dimensional visualization of coronary artery bypass grafts by electron beam tomography. Am J Cardiol. 1997;79:856-861. Nieman K, Pattynama PM, Rensing BJ, et al. 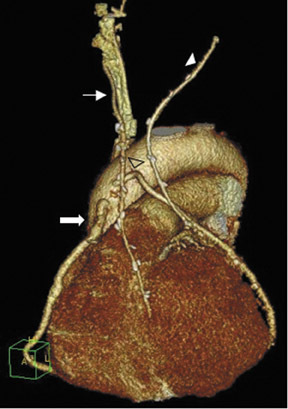 Evaluation of patients after coronary artery bypass surgery: CT angiographic assessment of grafts and coronary arteries. Radiology. 2003;229:749-756. Chiurlia E, Menozzi M, Ratti C, et al. 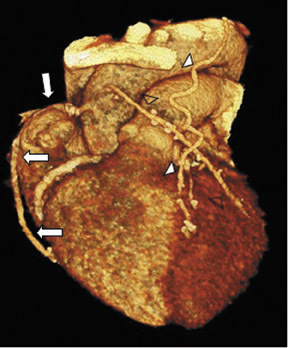 Follow-up of coronary artery bypass graft patency by multislice computed tomography. Am J Cardiol. 2005;95: 1094-1097. Schlosser T, Konorza T, Hunold P, et al. Noninvasive visualization of coronary artery bypass grafts using 16-detector row computed tomography. J Am Coll Cardiol. 2004;44:1224-1229. Flohr T, Stierstorfer K, Raupach R, et al. 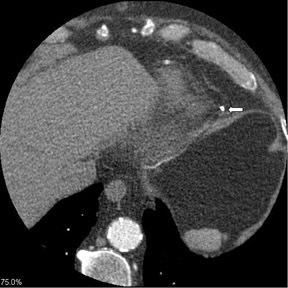 Performance evaluation of a 64-slice CT system with z-&#64258;ying focal spot. Rofo. 2004;176:1803-1810. Ropers D, Pohle FK, Kuettner A, et al. Diagnostic accuracy of noninvasive coronary angiography in patients after bypass surgery using 64-slice spiral computed tomography with 330ms gantry rotation. Circulation. 2006;114:2334-2341. Onuma Y,Tanabe K, Chihara R, et al. Evaluation of coronary artery bypass grafts and native coronary arteries using 64-slice multidetector computed tomography. Am Heart J. 2007;154:519-526. Meyer TS, Martinoff S, Hadamitzky M, et al. Improved noninvasive assessment of coronary artery bypass grafts with 64-slice computed tomographic angiography in an unselected patient population. J Am Coll Cardiol. 2007;49:946-950. Malagutti P, Nieman K, Meijboom WB, et al. Use of 64-slice CT in symptomatic patients after coronary bypass surgery: Evaluation of grafts and coronary arteries. Eur Heart J. 2007;28:1879-1885. Marano R, Liguori C, Rinaldi P, et al. 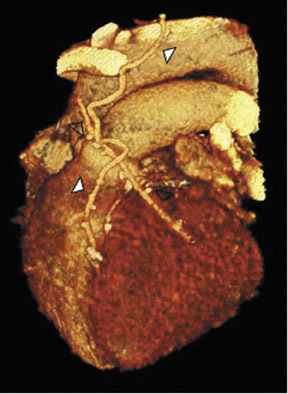 Coronary artery bypass grafts and MDCT imaging: What to know and what to look for. Eur Radiol. 2007;17:3166-3178. Garrett HE, Dennis EW, DeBakey ME. Aortocoronary bypass with saphenous vein graft. Seven-year follow-up. JAMA. 1973;223:792-794. Fitzgibbon GM, Kafka HP, Leach AJ, et al. Coronary bypass graft fate and patient outcome: Angiographic follow-up of 5,065 grafts related to survival and reoperation in 1,388 patients during 25 years. J Am Coll Cardiol. 1996;28:616-626. Motwani JG, Topol EJ. 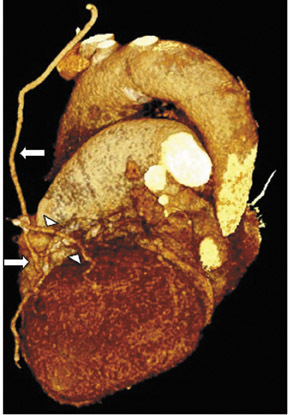 Aortocoronary saphenous vein graft disease: Pathogenesis, predisposition, and prevention. Circulation. 1998;97:916-931. The effect of aggressive lowering of low-density lipoprotein cholesterol levels and low-dose anticoagulation on obstructive changes in saphenous-vein coronary-artery bypass grafts.The Post Coronary Artery Bypass Graft Trial Investigators. New Engl J Med. 1997;336:153-162. Cannon CP, Mehta SR, Aranki SF. Balancing the benefit and risk of oral antiplatelet agents in coronary artery bypass surgery. Ann Thorac Surg . 2005;80: 768-779. Souza DS, Johansson B, Bojö L, et al. Harvesting the saphenous vein with surrounding tissue for CABG provides long-term graft patency comparable to the left internal thoracic artery:Results of a randomized longitudinal trial. J Thorac Cardiovasc Surg. 2006; 132:373-378. Eckstein FS, Bonilla LF, Englberger L, et al. Minimizing aortic manipulation during OPCAB using the symmetry aortic connector system for proximal vein graft anastomoses. Ann Thorac Surg . 2001;72: S995-S998. Cox JL, Chiasson DA, Gotlieb AI. Stranger in a strange land: The pathogenesis of saphenous vein graft stenosis with emphasis on structural and functional differences between veinsand arteries. Prog Cardiovasc Dis. 1991;34(1):45-68. Loop FD, Lytle BW, Cosgrove DM, et al. In&#64258;uence of the internal-mammary-artery graft on 10-year survival and other cardiac events. N Engl J Med. 1986; 314:1-6. Possati G, Gaudino M, Prati F, et al. Long-term results of the radial artery used for myocardial revascularization. Circulation. 2003;108:1350-1354. Marano R, Storto ML, Merlino B, et al. 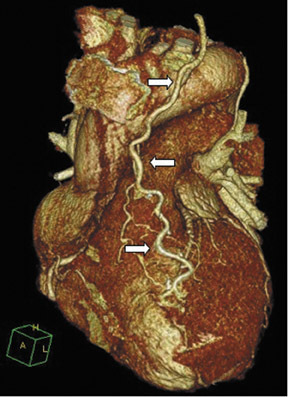 A pictorial review of coronary artery bypass grafts at multidetector row CT. Chest. 2005;127:1371-1377. Ura M, Sakata R, Nakayama Y, et al. Long-term patency rate of right internal thoracic artery bypass via the transverse sinus. Circulation. 1998;98: 2043-2048. Lytle BW, Blackstone EH, Loop FD, et al. Two internal thoracic artery grafts are better than one. J Thorac Cardiovasc Surg. 1999;117:855-872. Muneretto C, Negri A, Manfredi J, et al. Safety and usefulness of composite grafts for total arterial myocardial revascularization: A prospective randomized evaluation. J Thorac Cardiovasc Surg. 2003; 125:826-835. Pick AW, Orszulak TA, Anderson BJ, Schaff HV. Single versus bilateral internal mammary artery grafts: 10-year outcome analysis. Annals Thorac Surg. 1997;64:599-605. Carpentier A, Guermonprez JL, Deloche A, Frechette C, et al. The aorta-to-coronary radial artery bypass graft. A technique avoiding pathological changes in grafts. Ann Thorac Surg. 1973;16: 111-121. Buche M, Schoevaerdts JC, Louagie Y, et al. Use of the inferior epigastric artery for coronary bypass. J Thorac Cardiovasc Surg. 1992;103:665-670. Buche M, Schroeder E, Gurne O, et al. Coronary artery bypass grafting with the inferior epigastric artery. Midterm clinical and angiographic results. J Thorac Cardiovasc Surg. 1995;109:553-559; discussion 559-560. Comment in: J Thorac Cardiovasc Surg. 1995;110:1567-1568. Pym J, Brown PM, Charrette EJ, et al. Gastro-epiploic-coronary anastomosis. A viable alternative bypass graft. J Thorac Cardiovasc Surg. 1987; 94:256-259. Frazier AA, Qureshi F, Read KM, et al. 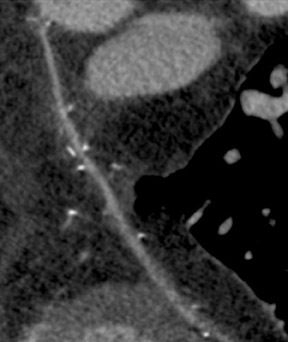 Coronary artery bypass grafts: Assessment with multidetector CT in the early and late postoperative settings. RadioGraphics. 2005;25:881-896. Douglas JS, Jr. Percutaneous approaches to recurrent myocardial ischemia in patients with prior surgical revascularization. Semin Thorac Cardiovasc Surg. 1994;6:98-108. Ricci M, Karamanoukian HL, D'Ancona G, et al. Reoperative "off-pump" circum&#64258;ex revascularization via left thoracotomy: How to prevent graft kinking. Ann Thorac Surg. 2000;70:309-310. Locker C, Mohr R, Paz Y, et al. Pretreatment with alpha-adrenergic blockers for prevention of radial artery spasm. Ann Thorac Surg 2002;74: S1368-S1370. Memon AQ, Huang RI, Marcus F, et al. Saphenous vein graft aneurysm: Case report and review. Cardiol Rev. 2003;11:26-34. Dubois CL, Vandervoort PM. Aneurysms and pseudoaneurysms of coronary arteries and saphenous vein coronary artery bypass grafts: A case report and literature review. Acta Cardiol. 2001;56: 263-267. Pepi M, Muratori M, Barbier P, et al. Pericardial effusion after cardiac surgery: Incidence, site, size, and haemodynamic consequences. Br Heart J. 1994;72:327-331. Kuvin JT, Harati NA, Pandian NG, et al. Postoperative cardiac tamponade in the modern surgical era. Ann Thorac Surg. 2002;74:1148-1153. Weitzman LB, Tinker WP, Kronzon I, et al. The incidence and natural history of pericardial effusion after cardiac surgery-An echocardiographic study. Circulation. 1984;69:506-511. Vargas FS, Cukier A, Hueb W, et al. Relationship between pleural effusion and pericardial involvement after myocardial revascularization. Chest. 1994;105: 1748-52. Loop FD, Lytle BW, Cosgrove DM, et al. J. Maxwell Chamberlain memorial paper. Sternal wound complications after isolated coronary artery bypass grafting: Early and late mortality, morbidity, and cost of care. Ann Thorac Surg. 1990;49:179-186; discussion 186-187. Roy MC. Surgical-site infections after coronary artery bypass graft surgery: Discriminating site-specific risk factors to improve prevention efforts. Infect Control Hosp Epidemiol. 1998;19: 229-233. Li AE, Fishman EK. 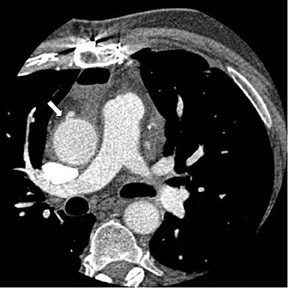 Evaluation of complications after sternotomy using single- and multidetector CT with three-dimensional volume rendering. AJR Am J Roentgenol. 2003;181:1065-1070. Braxton JH, Marrin CA, McGrath PD, et al. Mediastinitis and long-term survival after coronary artery bypass graft surgery. Ann Thorac Surg. 2000;70: 2004-2007. Gur E, Stern D, Weiss J, et al. Clinical-radiological evaluation of poststernotomy wound infection. Plast Reconstr Surg. 1998;101:348-355. Templeton PA, Fishman EK. CT evaluation of poststernotomy complications. AJR Am J Roent genol. 1992;159:45-50. Mueller J, Jeudy J, Poston R, White CS. 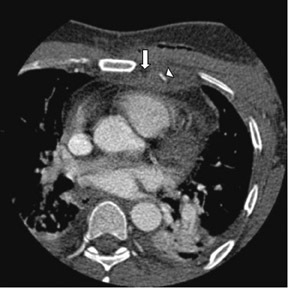 Cardiac CT angiography after coronary bypass surgery: Prevalence of incidental findings. AJR Am J Roentgenol. 2007;189:414-419. CT angiography for coronary artery bypass graft surgery. Appl Radiol.